Celebration is a community to the west of Kissimmee, near Walt Disney World Resort and originally developed by The Walt Disney Company. It is definitely worth a visit for all tourists visiting the Orlando area. The town itself remains directly connected to the Walt Disney World resorts via one of its primary streets, World Drive, which begins near Magic Kingdom and ends at Celebration Blvd. 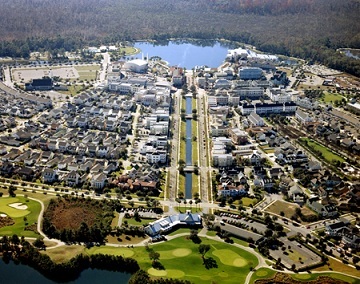 Celebration, FL is planned in an early 20th-century architectural style and is not zoned for high-density residences. Disney wanted to "make history" and develop a town worthy of the Disney brand and legacy that extended to Walt Disney's vision of an Experimental Prototype Community of Tomorrow (EPCOT). Celebration Town Center contains shops, restaurants, and other fine commercial establishments. More information about Celebration,FL can be found on Wikipedia.